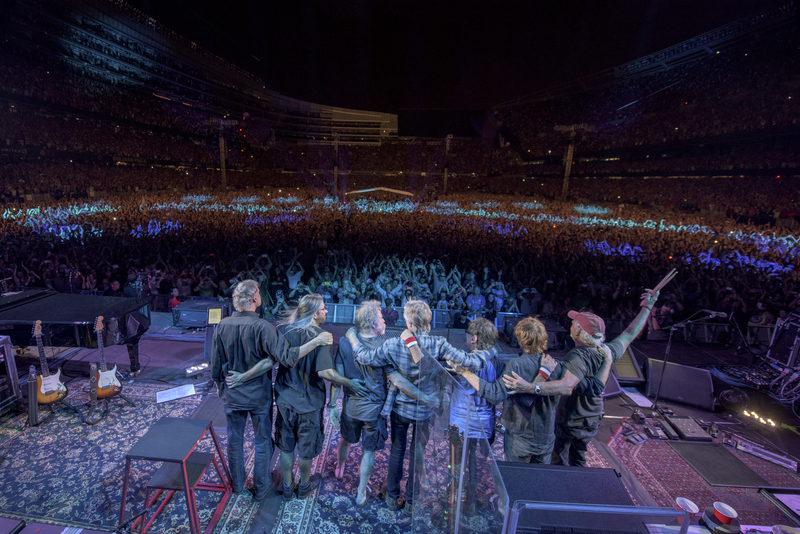 Last night’s final Fare Thee Well show; the final joint appearance ever by the Grateful Dead’s Core Four of Bob Weir, Phil Lesh, Mickey Hart and Bill Kreutzmann if you take them at their word – began and ended the same way: with a group bow and a huge roar from a giant crowd. It was that kind of night: emotionally heightened, with cheers and tears around every corner for the highly amped fans. 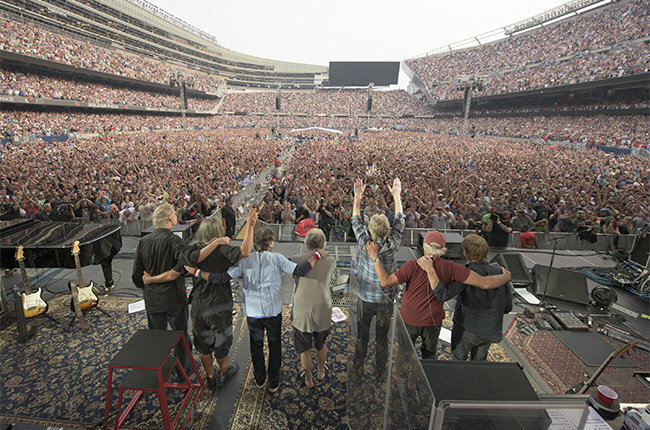 The good vibes were palpable throughout Soldier Field and inseparable from the music. I’m reviewing and writing about the experience of being in the stadium. If you wanted to write a removed analysis of the music performed, you’d be better off staying at home and watching a simulcast through a great system by yourself. Walk into the show and you’re impacted by everything around you. Spending three days in record crowds of up to 71,000 (last night’s released number) was an overwhelming experience. As my friend Jay said, there was as much community feeling as in any crowd ever. No one paid for me to be here. I bought my tickets, paid for my travel and joined the masses entering and exiting like rats in a maze. And like everyone else there, I was invested on many levels. None of us walked out feeling cheated. After the bow and crowd roar, the first set started out strong with “China Cat Sunflower” > “I Know You Rider,” songs people have been waiting for every day. 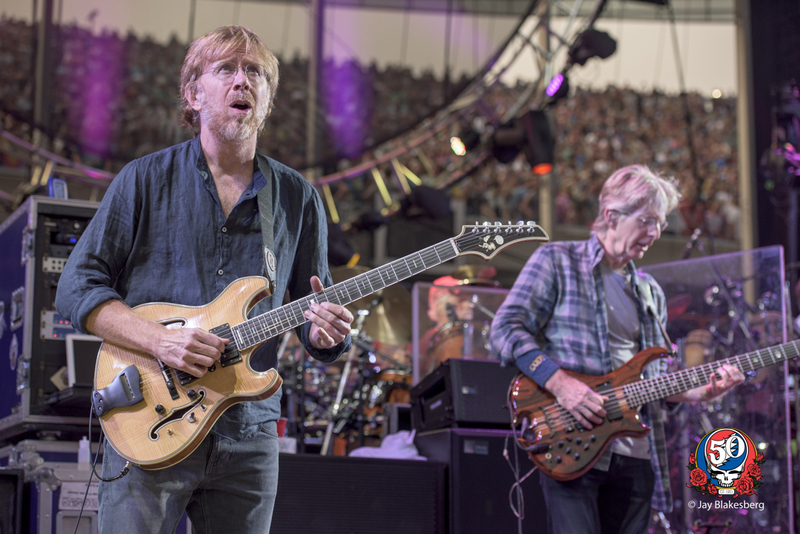 It all clicked, with Trey Anastasio stepping to the fore and Weir smiling like the Cheshire Cat as he stepped to the mic to sing his part of the “I Know You Rider” chorus harmony. 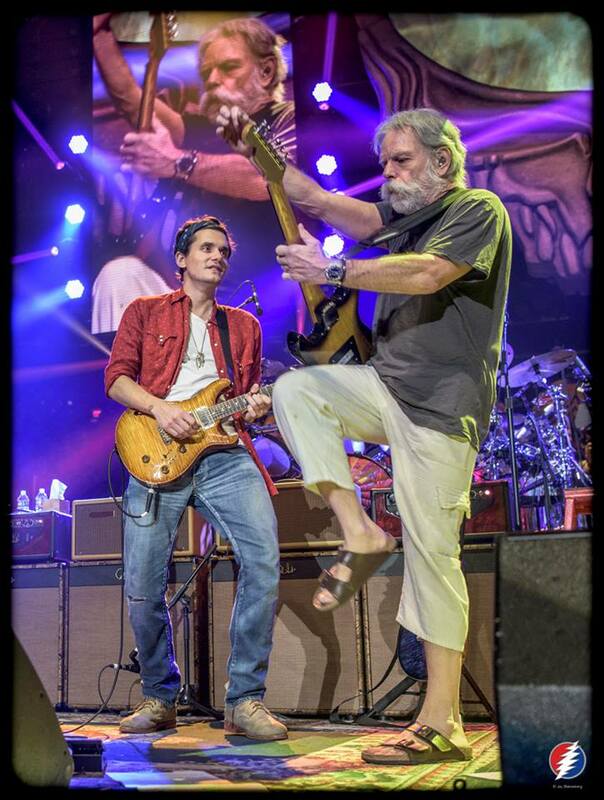 During an excellent “Estimated Prophet” that followed, Weir was jumping around as he engaged Anastasio. The strong, in sync playing continued throughout the first set. Anastasio has established great rapport with keyboardists Bruce Hornsby and Jeff Chimenti, with the three often engaging in call and response, harmony and counterpoint. “Built to Last” was nicely played, but remains a rather slight song in my estimation. “Samson and Delilah” was strong, with Chimenti throwing down a great surging organ solo. 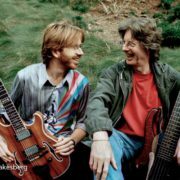 “Mountains of the Moon” was musically excellent, but Lesh’s lead vocal flattened the melody and… well, it was neither the first nor last time a song was musically superb but vocally lacking. 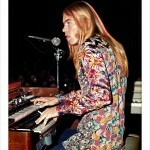 It was also, I believe, the first time that song had been played since 1969. 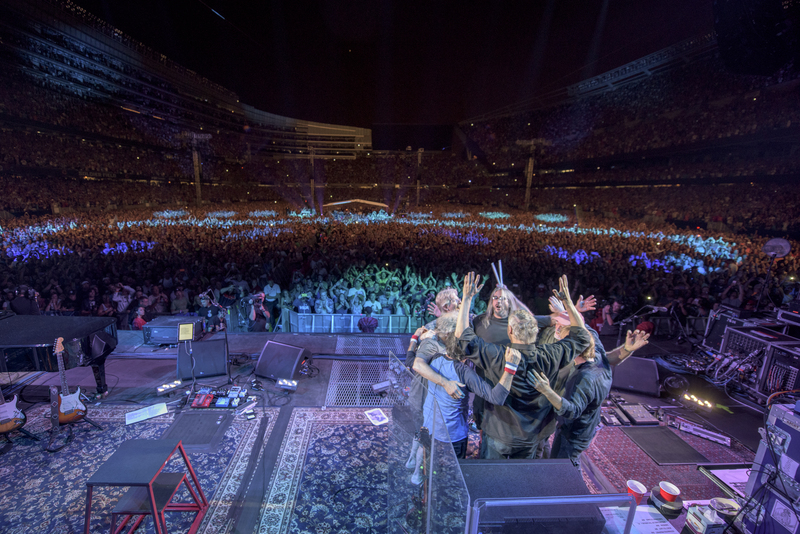 I understand that pulling something like that off is part of the Dead ethos, but on the final night, I’d have taken something like Bruce Hornsby singing “Loser” whether or not they played it last week in Santa Clara. 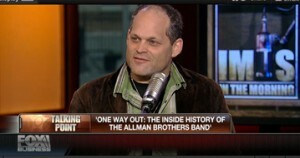 Emphasizing not repeating a song in a five-night run makes no sense to me at a time like this. The set closed strongly with “Throwing Stones,” with the “Ashes, Ashes” chorus a giant sing-along each time through and a very nice jam in the middle, involving everyone, that was one of the musical highlights of the concerts to that point. 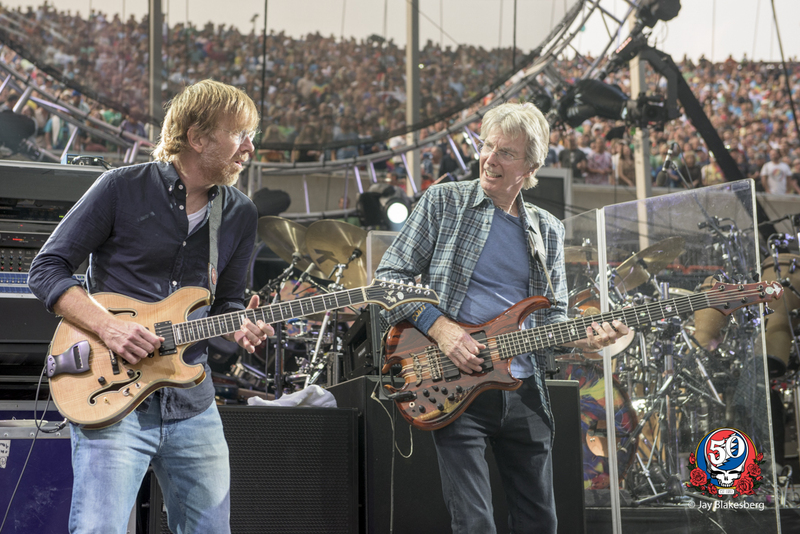 Have you checked out my new Ebook, Reckoning: Conversations With the Grateful Dead? Click on through. It’s cheaper than your coffee! 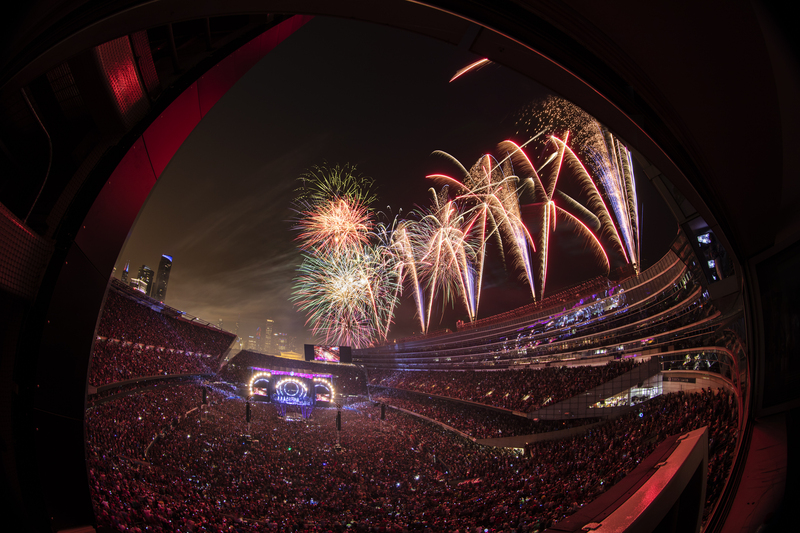 The second set – and perhaps the final in the Dead’s 50-year history – began with fireworks. Literally, a gorgeous, extended display over the stadium that made clear again that this was not a normal night. And after a nice, swirly intro, the band kicked into “Truckin’, ” a song that just HAD to be repeated and it was a great, hard-driving version. “What a long strange trip it’s been” was greeted with roars and mass sing-alongs every time through. Next up was a Space > Drums segment that was highly entertaining. I gladly squatted on the floor, taking a load off my legs, and looked up away from the stage watching Bill and Mickey do their mad scientist thing on the enormous Jumbotron on the stadium’s far side. That was quite the first half of a set. And then, of course, things got a little weird. Because the Dead need to get weird; they have a perverse sense of equilibrium. It’s just part of their DNA. They came out of Space and landed on “Unbroken Chain,” another Phil lead vocal. The song was strong but as the tension seemed to build to a resolution that could only be a hard rocker, the group went into the molasses slow “Days Between,” one of Garcia and Robert Hunter’s final compositions. Again, this was not on most people’s list of essential Dead listening, but players gonna play.